Cheyenne is a 14½-year-old, very petite graying black female, who was turned over to GALT as an owner release after being part of a family for many years. Dr. Jeff Ellis is in the process of evaluating her medical condition, but first results show she is heartworm negative at this time. She most likely has a urinary tract infection, and the results of the culture should be known soon. She is being treated for hookworms and a heart arrhythmia has been detected. 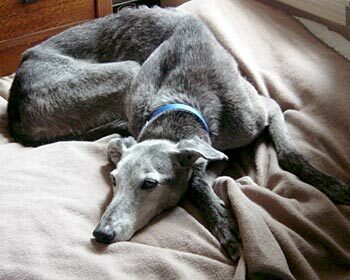 We hope at this time that with some TLC, a lot of love and attention, nutrition and proper medications, GALT can make her days left quality ones. We are in the process of tracing her racing history, if possible, so maybe we can add to her story. Cheyenne is one precious, precious little girl. See a video of Cheyenne at the bottom of this page. Cheyenne came into our home last night, August 3, very frightened and wobbly. She was very curious about our house, and I think she thought she was in a palace. We immediately set about to make her comfortable by setting up her bed next to ours. We put a plastic mattress cover over her bed with a nice soft blanket on top in the event there are any accidents. 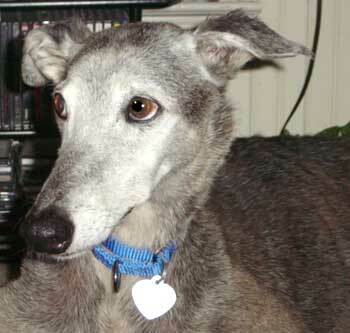 Cheyenne is a very skinny older lady that needs some good quality vittles and lots of love and patience. 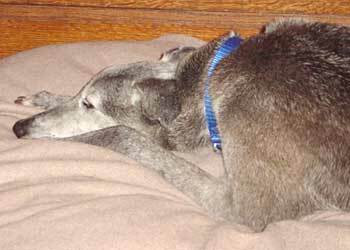 Last evening we made her a special mixture of our famous greyhound dinner (folks within GALT call it the spa meal). It consists of good quality kibble, cooked ground turkey, green beans, carrots, brown rice and low-salt chicken broth. This is what we feed our dogs daily and they have beautiful coats and and good energy. Cheyenne couldn't believe her eyes or tongue when she lapped up the food. She ate every bit and looked up at us with the most appreciative eyes. Later, she enjoyed yogurt dessert with her new brothers and sisters and a little more spa meal. This morning she stayed right next to us in the kitchen as we again prepared her spa meal. Like last night, she lapped up every bit. She gets to eat her meal in a special raised bowl on a soft mat, so she doesn't have to wobble while she eats. Cheyenne has a place to hang her bonnet for a while so we can get her back into good health. With a lot of tender loving care, I am confident this special girl will begin to emerge a new personality. Below are some pictures of her last night as she was getting comfortable with us in our den and in her new bedroom. 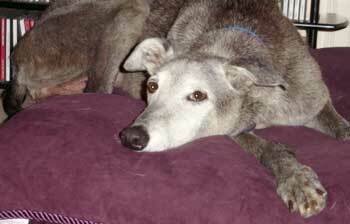 Cheyenne has been treated for a urinary tract infection and has responded well to the medicine. She is now in her FOREVER FOSTER HOME where she will stay for the rest of her life. Mary and Phil Waugh have generously and warmly opened their hearts and home to Cheyenne; she joins several other canine "siblings" there and gets along very, very well. GALT will continue to pay for all her medical needs and all treatments necessary to give her the best quality of life possible for the rest of her days. We are all saddened by the loss of Cheyenne, GALT's Grand Dam. Cheyenne's rear legs started giving way on September 1, and by Saturday she could not get up...she did not want to eat or drink at all. 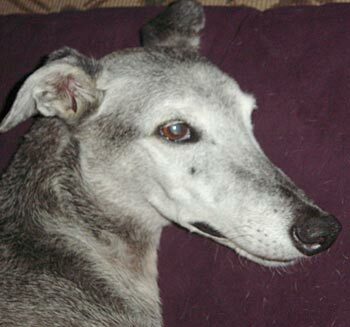 This precious girl was part of our GALT family for exactly 5 weeks.....we all had hoped for longer, but it was not to be. Mary and Phil Waugh have cared for her these past weeks as if she were their own...just as Suzanne Burke and Shawn Fernandez did when Cheyenne first came to GALT. 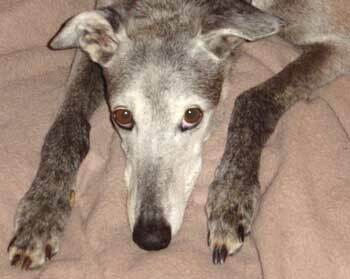 Cheyenne touched many lives and will not be forgotten - she will always be GALT's Grand Dam.